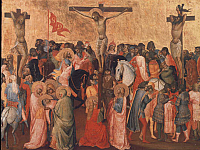 Born into a family of painters in Florence, Agnolo Gaddi followed an artistic lineage from his father Taddeo Gaddi (1300-1366), a painter and architect, and Grandfather Gaddo Gaddi, an artist. Agnolo Gaddi is known as the last major Florentine artist who was stylistically influenced by his father’s teacher, Giotto di Bondone (1267-1337). Better known as simply Giotto, Bondone was a master painter credited with starting the Italian Renaissance. Agnolo Gaddi got his start working on Frescos in Rome with his brother Giovanni, also a painter. The Fresco was done for the Vatican under Pope Urban the fifth. Perhaps his best regarded work soon followed, as he completed a series of frescos for the Basilica di Santa Croce in Florence, showing the “Legends of the True Cross.” Gaddi’s frescos for the Santa Croce appear in the Cappella Baroncelli and chancel, but also as stained glass in the chancel. 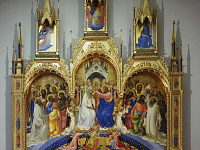 Both his father’s work and Giotto’s work also appear in the Santa Croce. Gaddi then painted the Madonna Enthroned with Saint and Angels, starting it in 1380 and finishing ten years later. Another piece he completed during those ten years was the Coronation of the Virgin. Though not confirmed, the piece is said to be a central panel of an altarpiece in the church of San Giovanni de’ Fieri outside Pisa. Carrying through his religious inspirations, he completed another well known piece in the 1390s, the Madonna of Humility with Angels and then one of his last pieces, Crucifixion. While working on the tempera based paintings, Gaddi also designed medallions, or trefoils for the Loggia dei Lanzi, which is still standing adjoined to the Uffizi Gallery in Florence. He completed these between 1383 and 1386, as works symbolizing the four cardinal virtues and they are mounted on the façade of the Loggia just below the parapet. Before his death in 1396, Gaddi painted a series of scenes about the Virgin Mary in the Prato Cathedral. His last work, left unfinished was for an altar in San Miniato al Monte near Florence. Gaddi was included in the art biographies of the Italian artist and historian, Giorgio Vasari.